Jacob Cooper Locker (born June 15, 1988) is a former American football quarterback. He played college football at the University of Washington, and was drafted by the Tennessee Titans eighth overall in the 2011 NFL Draft. Having grown up in Ferndale, Washington, Locker led the 2005 Ferndale High School to a 14–0 record and a state title, throwing for 1,603 yards and 25 touchdown passes for the season with only 3 interceptions. Locker was an excellent running quarterback, as he also rushed for 1,339 yards and 24 touchdowns during his senior year. Locker earned First-team All-America honors from Parade. He was also named the 3A state player of the year by the AP and Seattle Times, and earned First-team All-state honors from both organizations. In the 2005 Washington 3A state title game, Locker had four touchdowns and 272 total yards in a 47–12 win over Prosser High School. He helped Ferndale to a No. 12 ranking in USA Today's final West Region rankings, and a No. 12 ranking in MaxPreps.com's final national rankings. He was one of four Seattle Times "Blue Chip" recruits, ranked No. 5 nationally at QB, and No. 1 in the West, by PrepStar. Locker also ranked 85th in Scout.com's National "Hot 100" and ranked 68th overall and fourth among "dual-threat" quarterbacks in Rivals.com's national rankings. As a junior, he threw for 1,314 yards and 16 TDs and rushed for 987 yards and 15 TDs. Locker led Ferndale to a 13–2 record and a Washington 3A state runner-up finish in 2004, and was selected First-team All-state by the AP. As a sophomore, he threw for 713 yards with nine TDs, while running for 478 yards and three scores. In addition to quarterback, Locker played four years as a defensive back at Ferndale and was the first freshman ever to start in coach Vic Randall's 21-year career. Locker was also a standout baseball pitcher and outfielder. He was drafted by the Los Angeles Angels of Anaheim in the 40th round (1212 overall) of the 2006 Major League Baseball Draft but did not sign so he could attend the University of Washington to play football. Locker during a game at Husky Stadium in Seattle, Wash. against Apple Cup Rivals Washington State. On July 31, 2005, Locker committed to the Washington Huskies football team. Husky fans quickly dubbed him Montlake Jake and was expected to be the dismal program's savior. In 2006, Locker won UW's Pepsi Player of the Week Award for his work on the service team after the Fresno State, Arizona and Washington State games. He made the travel squad for every game, and suited up for all 12, but didn't see any game action. During this time Locker quarterbacked the UW service team. Locker in 2007, was named the Rivals.com Freshman of the Week following his two rushing TD performance in the opener at Syracuse. He carried the ball 10 times for 83 yards and went 14-for-19 passing for 142 yards. He was named the SIonCampus.com Player of the Week after leading the Huskies to a 24–10 win over then 20th-ranked Boise State, snapping the Broncos' 14-game win streak. During a loss to Arizona, he became the 19th player in college football to pass for 300 yards, and run for 100. Locker was handed the starting quarterback position prior to the start of spring drills and emerged from pre-season drills as the team's starter. On November 10, 2007, Locker was injured during a game against Oregon State University, and was removed from the field by an ambulance and taken to Good Samaritan Hospital in Corvallis, Oregon. He was able to return to the stadium in the fourth quarter to watch the end of the game, though he was wearing a neck brace. Locker was named to the Rivals.com 2007 Freshman Second-team All-America  and was named Pac-10 Freshman of the Year. In 2007, he set UW records for rushing yards in a season by a freshman (986), rushing yards in a season by a quarterback (986, which is also a PAC-10 record), rushing attempts by a quarterback (172), passing yards by a freshman (2,062), touchdown passes by a freshman (14) and longest pass completion (98 yards to Marcel Reece vs. Arizona). During summer of 2008, Locker played outfield for the Bellingham Bells of the West Coast Collegiate Baseball League, where he was named by Baseball America as the league's top prospect. On the 4th day of practice going into the 2008 season, Jake Locker partially tore his hamstring. He resumed full practices on August 18, 2008. In the Huskies' second game of the 2008 season against Brigham Young University, with the Huskies trailing 28—21, Locker scored a rushing touchdown with two seconds remaining to bring the score to 28—27. After tumbling into the end zone, Locker threw the ball up into the air and was assessed a 15-yard unsportsmanlike conduct penalty. This backed the point after touchdown kick, which was to tie the game and in all likelihood send it to overtime, from the 3-yard line to the 18-yard line. The kick was blocked and UW lost the game by that 28—27 margin. The call was seen as controversial, in that it followed the letter of the rule dictating that players who score a touchdown must hand the ball over to officials in an orderly fashion but some believe violated its spirit, because Locker's act of throwing the ball was simply an emotional reaction to a big play and not an attempt to taunt his opponents or delay the game. Locker later apologized for incurring the penalty. On September 27, in a game against Stanford, Locker suffered a broken thumb and was unable to play for the remainder of the season. On September 19, 2009, Locker led the unranked Washington Huskies to a 16–13 victory over the 3rd ranked USC Trojans. Late in the 4th quarter, Locker engineered a 68-yard drive, with the game tied at 13–13, that ended with a 22-yard field goal with 3 seconds remaining that put the Huskies up 16–13. The win allowed the Huskies to move to 24th in the AP poll; this was the first time they had been ranked since the 2003 season. Locker and the Huskies would go on to have an up and down season, finishing with a 5–7 record highlighted by a 42–10 blowout win of No. 19 California to close the season. On December 14, 2009, Locker released a press release through the Washington athletic department indicating his decision to remain in school and play his senior year at Washington, rather than turn pro. 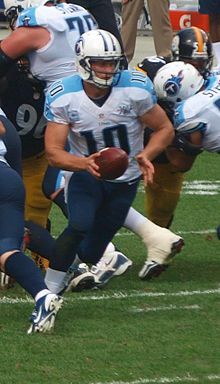 For his performance in 2009, Jake Locker was named Male Sports Star of the Year in the 75th annual Seattle Sports Star of the Year awards. In 2010, Locker was a finalist for The Premier Player of College Football Trophy that's awarded based on the votes of fans. Locker closed out his college career with a 19–7 win over heavily favored Nebraska in the 2010 Holiday Bowl despite completing only 5 of 16 passes in the game. This atoned for a 56–21 loss to the Cornhuskers in Seattle earlier in the season, a game in which Locker was criticized for his 4–20 performance with 2 interceptions. 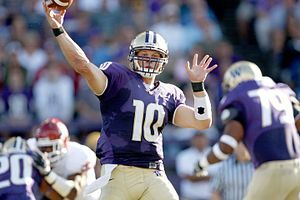 With one year of eligibility remaining at Washington, Locker was considered to be a top prospect in the 2010 NFL Draft by many internet mock drafts, with some analysts ranking him in the top three available quarterbacks. On December 14, 2009, ESPN's College Football Live reported that Locker would return for his senior season. Schefter posted on his Twitter page that an anonymous NFL GM, in speaking with ESPN NFL analyst Chris Mortensen, told Mortensen that Locker is "a bigger, taller, right-handed version of Steve Young." Prior to Locker's announcement declaring his intention to stay for his senior season, ESPN draft analyst Todd McShay had projected Locker as the No. 1 overall pick in the 2010 NFL Draft. But there was also some disagreement in certain circles with McShay's assessment—it had been reported that Locker was advised by the NFL Collegiate Advisory Committee that he would not have received a "1st round grade". ESPN analyst Mel Kiper, Jr. predicted before and after the 2010 NFL Draft that Locker would be the No. 1 overall pick in 2011. ESPN analyst John Clayton stated in October of Locker's disappointing senior campaign that the right-hander may fall to the 2nd or 3rd round in the 2011 draft due to his inaccuracy and poor play. Locker was selected with the 8th overall pick in the 2011 NFL Draft by the Tennessee Titans. On July 29, he signed a 4-year contract worth a reported $12 million. Locker saw his first real playing time on November 20, against the Atlanta Falcons, replacing an injured Matt Hasselbeck. In a losing effort, Locker threw for 2 touchdowns and 140 yards. Locker completed his rookie season with 4 passing touchdowns as well as 1 rushing touchdown. He acted as backup and occasional relief to Hasselbeck. After competing with Hasselbeck during the 2012 preseason, Locker was named the starter for the regular season on August 20, 2012. His first start came on September 9 against the Patriots and was a rough affair as he completed 229 yards passing and one touchdown with one interception. His first win came on September 23 against the Lions as he threw for 373 yards and two scores in a 44-41 overtime Titans win. On September 30, Locker tore his non-throwing shoulder, and was replaced by Hasselbeck. Locker was later confirmed by Titans head coach Mike Munchak as the starter on November 9 against the Miami Dolphins. Locker finished 2012 with 177 completions, 2,176 yards, ten touchdowns, and eleven interceptions. He rushed 41 times for 291 yards and a touchdown. Jake Locker vs. Pittsburgh Steelers in 2013. The Titans started their season week 1 against the Pittsburgh Steelers. He went 11/20 passing and had 0 touchdowns and 0 interceptions in the 16-9 win. The following week against the Houston Texans Jake Locker was trying to get the Titans started off 2-0. He completed 17/30 of his passes for 148 yards with 2 touchdowns and 0 interceptions, but the Titans ultimately fell short in the game losing 30-24 in overtime. On September 22, 2013, Locker became the first Titans quarterback to beat the San Diego Chargers since the club's 1992 season as the Houston Oilers; Locker threw a 34-yard strike to Justin Hunter with fifteen seconds to go, securing a 20-17 Titans win. Locker earlier in that game had rushed in a seven-yard score. On September 29, 2013, in a 38-13 win over the New York Jets, Locker was hit by two Jets defenders and was carted off the field with what appeared to be a serious right leg injury. Initial news reports, from multiple sources, indicated that the injury was to his right hip. Locker, according to a report by the team posted on USA Today, would miss three weeks. On October 19, the ESPN website reported Locker would start against the 49ers; he completed 25 passes for 326 yards and two touchdowns with his first interception of the season in a 31-17 loss. On November 3, Locker played against the Rams. He completed 13/22 of his passes for 185 yards. He had no touchdowns and 2 interceptions. He added on 3 carries for 10 yards and a touchdown rushing. Despite a poor passing performance, the Titans won 28-21. During a November 10 loss to the Jacksonville Jaguars, Locker sustained a Lisfranc injury to his right foot, ending his season. Locker started off the 2014 season under new head coach Ken Whisenhunt. He played in week 1 against the Kansas City Chiefs and completed 66% of his passes for 266 yards 2 touchdowns and 0 interceptions. He had a passer rating of 111.4. On October 22, 2014, Locker was benched along with Charlie Whitehurst in favor of rookie quarterback Zach Mettenberger. On December 14, 2014, he was placed on injured reserve, ending his season. Locker announced his retirement from the NFL on March 10, 2015, citing his lack of desire to play any longer. Jake's father, Scott, and three uncles (Mike, Pat, & John) starred at Ferndale High School and went on to play at Western Washington University. His father, Scott Locker owns an insurance agency, Locker & Ebert Insurance. Jake Locker's grandfather, Hugh Locker worked at a pulp mill for 37 years. His uncle Pat Locker, a running back for WWU (1976–79), was named the Western football player of the century. Pat Locker was the first player in northwest collegiate history and 37th player in the history of college football to reach the 4,000-yard mark in career rushing (4,049). Jake has two younger sisters, Alyssa and Erika. Erika was a guard on the Central Washington University women's basketball team from 2013 to 2015. His cousin Casey is currently a starting safety on the Washington State Cougars football team. Locker was drafted by the Los Angeles Angels of Anaheim in the 10th round of the 2009 MLB draft. Locker clarified that his primary focus is still on football and that playing baseball would merely be a fallback plan. He is currently still signed with the team. Locker's hometown Ferndale declared the day of its annual Old Settlers Picnic to be "Jake Locker Day". On December 18, 2010, Locker became engaged to Lauren Greer, a former University of Washington softball player. The two married and have a daughter, Colbie, and a son, Cooper. In 2013, all three of them were on a "faith values" program at Lipscomb University. ^ "Jake Locker Player Stats". Statewide Stats. Archived from the original on August 14, 2007. Retrieved January 22, 2008. ^ "Blue-chip football recruits". The Seattle Times. January 26, 2006. ^ "Locker leads Ferndale to 3A state championship". The Seattle Times. December 2, 2005. ^ "40th Round of the 2006 MLB Draft". June 10, 2006. ^ Miller, Ted (August 1, 2005). "Ferndale QB Locker commits to Washington". Seattle PI. ^ a b c Yardley, William (December 30, 2010). "A High-Tech City's Down-Home Hero". The New York Times. p. A14. ^ "Summer College Leagues: Top 10 Prospects". BaseballAmerica.com. Retrieved September 11, 2008. ^ "Jake Locker is Back". Jake-Locker.com. Retrieved August 19, 2008. ^ Booth, Tim (September 6, 2009). "No. 15 BYU holds on for 28–27 win over Washington". Yahoo Sports. Retrieved September 6, 2008. ^ Staff. "Locker to return to Washington for senior seasonl". University of Washington. Retrieved December 14, 2009. ^ Staff (January 19, 2010). "Sports Star of the Year announced". Seattle Times=2010-01-19. Archived from the original on January 29, 2010. ^ William Yardley. "A High-Tech City's Down-Home Hero". New York Times. Retrieved February 19, 2018. ^ Schefter, Adam. (December 9, 2009).Twitter.com Retrieved December 10, 2009. ^ Florio, Mike (December 18, 2009). "Locker didn't get a first-round grade from Advisory Committee". Pro Football Talk . ^ Condotta, Bob (April 7, 2010). "NFL draft expert says Washington QB Jake Locker will be first pick in 2011". Seattle Times . ^ Johns, Greg (April 26, 2010). "Kiper: Locker a 'legit possibility' to go No. 1 next year". Seattle Post-Intelligencer . ^ "Jake Locker, DS #3 QB, Washington". nfldraftscout.com. Retrieved April 26, 2011. ^ "Jake Locker scores low on Wonderlic". Retrieved July 27, 2011. ^ "Tennessee Titans agree to terms with Jake Locker, Akeem Ayers". Retrieved July 29, 2011. 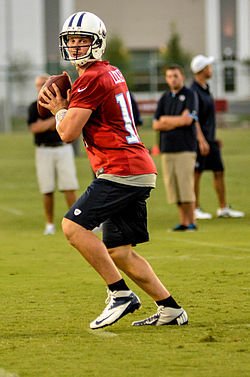 ^ "Jake Locker set to return to Tennessee Titans' lineup". National Football League. November 9, 2012. Retrieved November 9, 2012. ^ Patra, Kevin. "Jake Locker announces retirement from NFL". NFL.com. Retrieved March 10, 2015. ^ Bishop, Greg (April 18, 2018). "Why Jake Locker Walked Away From Football—and Why He Doesn't Miss It". Sports Illustrated. Retrieved January 14, 2019. ^ "Jake Locker profile". GoHuskies.com. CBS Sports. Retrieved January 2, 2011. ^ Moore, Jim (August 8, 2007). "Go 2 Guy: QB Locker just a 'perfect young man'". Seattle Post-Intelligencer. Retrieved January 2, 2011. ^ "Jake Locker Engaged to Lauren Greer". Jake Locker Fan Website. December 20, 2010. Retrieved December 22, 2011. ^ Jones, Kristi (May 2013). "NFL quarterbacks discuss their faith at Lipscomb University" (PDF). Christian Chronicle. Oklahoma City: Oklahoma Christian University. p. 23. Retrieved April 12, 2013. Wikimedia Commons has media related to Jake Locker.